Day 90, Bats in the Belfry? No? Wasps in the Clocktower? Oh, My! Visit Mr Bucket, at his spot in North Link, to discuss arranging a horse trailer to North Link. Full Speed to North Link! Good day to you Rita! So nice of you to visit this remote backwater, it’s certainly not every day we have such lovely visitors! It is fairly time-consuming to get here. One might not exactly say it was a terribly exciting journey. What if it was somehow possible to shorten the path to Silverglade Village? Say, Rita, would you be interested in changing the current situation? A so called trailer to North Link could well be a good idea… What do you say? As you know, I myself must continue in my efforts to poke out any irregularities here at North Link, but you are, shall we say, more mobile than I… I dare say you might well be able to tackle this matter with tremendous enthusiasm! Are you interested? Good Rita, very good indeed! Then I suggest you begin by consulting the Baroness. Most of the land around here is under her ownership you see. It’s also common knowledge that she’s in possession of the necessary funds for the acquisition of such a vehicle. Right then! I look forward to, in the not too distant future, a faster and more efficient transportation method for Silverglade Village than hitherto offered. The very best of luck to you, young Rita. Please present the radiant honorable lady Baroness with the very best of my regards. Objectives: Ask the Baroness about the possibilities for a horse trailer to North Link. Ride to the Winery and speak to the Baroness there. Good day to you, dearest Rita. How can I be of assistance this fine day? Mr Bucket wants me to organize and pay for a horse trailer to North Link? I’m afraid I don’t see the use of such a trailer, and I have no grasp of quite why it should be me who should finance such a misadventure. No, Rita, you’ll have to let him know that I’m not interested. Hmm? What did you say my dear? It would help you, too? Well well, I certainly shan’t provide funds, but if you can find someone else who will, then you have my permission to place the trailer on my land next to the racetrack. My view is that if anybody should pay for it, it should be Silverglade Council. A horse trailer to the northern side of the Everwind Fields could well be of benefit to the entire community. I rather think you should discuss this with the Council Man in Silverglade Village. Bye bye Rita! Objectives: Ask the Council Man in Silverglade Village about the horse trailer idea. Well, fine then, be a stingy old bat… I never liked you that much anyway. Ride to Silverglade Village and speak to the Council Man by the Town Hall. Hello there Rita! How are things? Do please excuse my outfit, Rita; I’m having to wear my ‘backup’ suit today. You don’t see a difference? What luck. What can I do for you today? A horse trailer to North Link? You’ve already got permission from the Baroness to place it at the Racetrack? It all sounds rather interesting, but I dare say our budget won’t allow for it right now. Listen, how about you help me with a little problem I’m having and in return, I’ll look over the books and see if there aren’t a few pennies to be pinched here and there from the Council budget. What do you say? Ah, magnificent! So here’s the thing: this morning, there was a very unfortunate incident that I can’t say I wish to speak of. Anyway… Somebody stole my clothes! Right there from under my nose! Stolen! I do believe however that the cheeky thief threw the clothes away as he or she escaped. Perhaps you could take a look around and see if you could find my jacket, my handkerchief, and my tie. I’d be very grateful indeed. They’ll be here in the village somewhere. And listen, not a word about this to anyone. Please promise me that! Ride around the village to find his articles of clothing. When you have found all of them, return to the Council Man. How did it go? You found all my clothes?! Marvelous! My loveliest jacket. All busted and broken! Oh, Rita. Do you think you could run this over to the tailor for me? He’s right here in the village of course, and it would be a wonder if you could ask him to repair it. I promise after all of these little favors, I’ll definitely look into whether I can help you with this trailer idea of yours. Objectives: Take the Council Man’s jacket to the tailor in Silverglade Village. Ride to Donald, around the corner, behind Town Hall. Well hello there! The Council Man’s jacket is all broken, you say? Well then, it’s clear he’ll want it repaired on the double! Right now, I’m unable to sew anything at all. Sigh. I was over at Steve’s Farm, looking for stuffing for a chair I’m upholstering for Barney. He wanted a more rustic feel, so I went to Steve’s and looked through all the hay bales there so that I might find the comfiest hay. During my search, I must have lost my needle… As the old saying goes, something that’s impossible to do is like finding a needle in a haystack, but my needle may well be there amongst any number of haystacks, not just one! How impossible is it going to be to find it?! Sigh. Without my special sewing needle, I quite simply don’t have the desire to work at all. You’ll take a look for it? Oh my, how lovely! There’s probably not much point, but feel free to try. Oh well, good luck. If you find my needle, I promise I’ll mend the Council Man’s jacket right away. Objectives: Find the tailor’s sewing needle in amongst the bales of hay at Steve’s farm. Ride to Steve’s Farm and search the haystacks that are indicated on your minimap. When you find the needle, return to Donald. You found the needle?! No!! Wow! This is wonderful!! Oh, how wonderful! A true marvel, Rita! I’ll get to work immediately and have the Council Man’s jacket ready quick-smart! With my favorite needle, it’ll go like a dream! Here’s the jacket, and give the Council Man my best! Objectives: Give the newly repaired jacket to the Council Man in Silverglade Village. Return with the repaired jacket to the Council Man. Oh, marvelous! That went very quickly. He’s ever so good, that tailor. Well, one other thing, my dear. It seems that someone has dumped an extraordinary amount of litter all around the Town Hall. All kinds of papers are flying around all over the place. Could you help me clean up? I have been able to grab most of the papers but there are some swirling so horrifically fast that I just can’t get my hands on them. Objectives: Catch all the papers flying around Silverglade Village and return them to the Council Man. Reputation: 15 with Silverglade Village. Ride around and catch the swirling papers. They don’t move very quickly so they should be easy to catch. They are all inside the village walls. When you have caught all of them, return to the Council Man. You’ve caught up with all the papers flying around the place? Handsome work! My signature was on them? You should have read them, I said… Hmm, okay. suppose I should tell you what’s happened. Okay, okay. The papers were all mine, and there wasn’t really a thief who made off with my clothes. It’s all rather embarrassing. I’m certainly no slacker, but this morning I was so very tired that I snuck away to take a little snooze. It’s honestly not something I’d usually do, but somehow this morning I was sleepy enough to have it be the first time. I crept up into the clock tower where there isn’t usually anybody around. I laid down right in front of the clock face so I could have a nice view, and as I was getting comfortable, I noticed that the minute hand was a little off. Not by much, but when you’re right next to it, you may as well do something to try and fix it. I opened up the little hatch next to the clock face and climbed out to set the minute hand straight. I’ve seen Big Bonny do it a hundred times and it looked like a piece of cake, but I can tell you it most certainly was not! As I reached out, I slipped and fell out of the hatch! 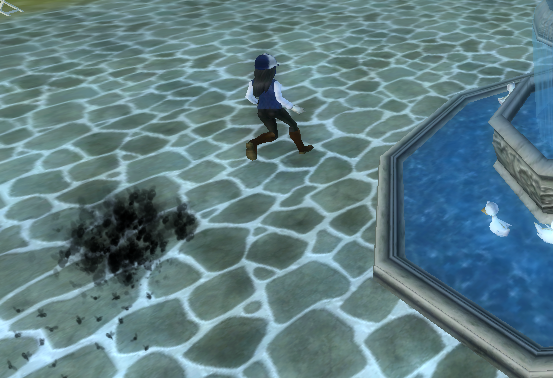 I just about managed to grab hold of the minute hand and stopped myself falling to a certain death in the town square. So there I am, alive at least, but how would I get back up again? I tried to swing my legs to get some kind of grip so that I might lift myself up but it didn’t quite work. The only thing I managed to do was to kick a nest of wasps, and my good gracious, they buzzed out of that nest as quick as a flash! I fled down the stairs and through the village and that’s when I lost all the papers along with the rest of my clothes. Up to the castle I ran, and it was only when I got all the way up there that I noticed the wasps had stopped following me. So, now you know the truth. Promise not to tell anyone! If you could just retrieve my trousers from up in the clock tower, I promise I’ll get that horse trailer on the road for you. Do we have a deal? Thanks Rita, I can always rely on you! Since you’re much younger and stronger than me, you’ll probably have no problem getting out through the hatch up there and retrieving my trousers. Objectives: Go up into the clock tower and see if you can find the Council Man’s trousers. Dismount your horse to enter the small door to the clock tower, near the stairs that go down into the main village square. When in the clock tower, go all the way to the top to find the Council Man’s trousers. Objectives: Hot-foot it out of the Clock Tower before you’re stung by the wasps. This quest will take several tries to complete as it is a little difficult without practice! You have five seconds to run down the stairs and make it to the exit of the clock tower. If you do not reach the exit in time, you will be stung and have to start over. Stop your character as far away from the wasps as you can while still being able to initiate the dialogue. Also, turn your character towards the stairs as much as you can. If you use the keyboard to move, keep your cursor on the screen, about your character’s head (to be able to quickly click on the exit when you reach it). When you are running down the stairs, stay on the opposite side of the next stairwell (i.e. on the far left with the first stairs, then on the far right with the next stairs) so that you can make the wide turn needed to keep the running pace. I completed it in three or four tries. It is not extremely difficult but will need some preparation and a bit of practice to be able to do it quickly. When you reach the outside, the wasps will stop chasing you. Speak to the Council Man when you escape. Oh! You’ve got my trousers! No? Oh. You were attacked by wasps you say? Furious you say? I’d have though they’d have flown away by now. What on earth should we do then? Here, I wonder if Big Bonny could help us? What do you reckon? It’s her clock to all intents and purposes, so I rather think she should step up and help us with this! Rita, be a darling and ask Big Bonny for help, but hurry! These backup trousers aren’t anywhere near as warm as my regular ones, and even though I’m wearing my extra-cozy pink underpants, I’m still freezing my buttons off! Umm… Forget the bit about the pink… Whatever. Yes. Bye. Ahem! So, Miss Rita, go and ask Big Bonny and I’ll wait here. Objectives: Ask Big Bonny for help with the wasp issue. Speak to Big Bonny in front of her house behind the clocktower. Hello there, Rita, my little dazzling jewel of the skies! What I’m doing? Well. I just returned from my usual stroll around the village so that I might absorb the love and joy and gratitude so freely beamed towards me by the residents of this breathtaking paradise. It’s almost a touch on the awkward side, you know, having to put up with how much they all look up to me, but it’s a burden I carry with pride. So, what brings you to me on this day? Some kind of heroic deed that you need me to heroically deedify? Some heroically heroic deedification? Hmm? The Council Man’s trousers are stuck in the clock. In the clock in the Clock Tower. Rita! Who exactly do you think I am? It’s straight up-and-down shameful that you come to me, ME, with this kind of filthy suggestion. I’m not some kind of filth wizard, you know. His filthy old pants, that he’s hung in my clock tower, and you think I’m some washer woman who’ll just come and take them to him all neatly folded and pressed like I’m some sort of dry cleaning clockmaker? It’s not laundry? He was about to fall from the tower?! Hmph! Well then, if he’s silly enough to be up there unsupervised in the first place, then his tacky old trousers can very well stay up there. I’ll not for a second be taking them down. What? Wasps? There were some furious wasps in the tower that scared him so much so that he lost his trousers? Haha! Well, this story just gets more and more ridiculous, Rita, and I think I might very well stop listening before I puncture a lung from laughing so much. STOP! REWIND! REWIND THE TAPE! REWIND, REWIND, REWIND! WHY DOES ALL THIS WICKEDNESS AND ATROCITY ALWAYS VISIT ME?! Stand yourself there my little diamond and allow me to tell you something. This clockmaker is in no way a friend of the wasp. We’ve been mortal enemies since the beginning of time. WAAAAAASPS!! OH MY GOATS!! I can barely breathe with the rage of simply thinking about them. Those little beasts are in MY clock, and everyone knows Big Bonny’s rhyme: whippety whipple, whippety wok, ain’t nobody got time for wasps up in their clock. So yeah, I swear to get back the Council Man’s trousers if it’s the last thing I do! I promise here and now that those trousers will be back on his beautiful legs even if it costs me my life! My life! I HEREBY SACRIFICE MY LIFE FOR THE COUNCIL MAN’S TROUSERS!! DO YOU HEAR ME??!! Mm! I think everyone heard that. It wouldn’t do to die in service and have nobody know about my heroic sacrifice. So, Rita, here’s the plan. Listen carefully, I shall say this only once! I’ll sneak into the clock tower, creep up the hugely dangerous stairs, unfold myself out of that deadly hatch and onto that dismal clock face, protected only by the very safe safety cord attaching me safely to the tower. Then, very carefully, very slowly, yet incredibly heroically I shall reach out and PLUCK the trousers from the clock face and remove myself from the death trap that is the clock tower without losing my balance or the trousers. It’s incredibly, uncommonly, astonishingly, FABULOUSLY DANGEROUS, so it’s not something I’m comfortable leaving up to you, Rita. But fear not, my little pumpkin, you can also be a part of this heroic act of heroism. I have a very simple and entirely danger-free task for you. Not especially packed with honor or prestige, but just by helping me, people will certainly come to see you as some kind of shadow-dwelling semi-hero anyway! Some kind of sidekick to the main legend perhaps? So! The only thing you need to do is climb up into the clock tower and make the wasps so extraordinarily furious that they come after you and try to sting seven shades of Sunday out of you… When they’re screamingly furious, all that you need to do is run out of there and let them chase you a bit while I get the trousers. Shouldn’t take more than about a quarter of an hour. Piece of cake! If it’s dangerous? Unfortunately, we don’t have time for questions. Get going! Up in the tower with you, and make those wasps’ blood boil! Don’t worry, I’m right behind you the whole time! Objectives: Go up into the clock tower and enrage those wasps! Make them angry! Approach the wasps again to make them angry. You will need to do your run out of the clock tower again, so make sure to position yourself to be ready for it. Objectives: Escape the clock tower before the wasps catch you. Recreate your first great escape. Hopefully it should be easier this time, but if not, my first advice still applies. When you make it out of the clock tower, speak to Big Bonny at the top of the stairs by the entrance to the clock tower. Are the wasps after you now? Ah, supreme. This is going swimmingly! Run, Rita! Run as fast as you can! Run, you fool! Hope you aren’t allergic to wasps stings!! When you have evaded the wasps, speak to Big Bonny again. I made it, Rita! I did it! Ooooh yes, the feeling of accomplishment from having done this task makes my heart frizzle with delight! Of course you should also receive a little thank you, because even if your contribution isn’t really as big as mine, you did in fact make a little effort in sharing part of the work. If I’m not exaggerating? Haha! I’m only going so far over the top because I’m so flippin’ lovely! Your contribution to this mammoth task was basically zero, but people are going to talk about how you were part of it all anyway, so I suppose I may as well talk up your role a tiny bit. But that’s just Bonny y’know! A great old girl with a heart of gold! Naahh, y’know what? I need to get myself home and take it easy for a while before all the reporters come running, demanding an interview with me! You might as well give the trousers to the Council Man. If he insists on building a statue in my honor, then he should really place it atop the highest tower of the castle. That way everyone will be able to see it and be inspired by my quest for perfection. Objectives: Give the trousers to the Council Man in Silverglade. Oh, lovely! You have my trousers! Did you get any help from Bonny? Actually, don’t tell me. I’m sure she’ll have plenty to say about what she did next time I see her. Now, I’m going to get to work on keeping my promise and start looking for some spare money for a horse trailer by the Racetrack! It might take a while, but I’m sure I’ll come up with something if you’re patient! Return to the Council Man tomorrow.